We all have those nights when we’re driving home from work that we’re so tired, frustrated, and hungry that we want to knock over a Taco Bell (“Keep the money just give me all of your Grilled Stuffed Burritos…to go”) or just eat anything that doesn’t move too fast. I’ve had to be hyper-vigilant because I’m temporarily barred from exercise and, well, I actually want to lose weight. Last night was one of those nights for me. I had worked late instead of doing my usually Thursday night routine – leaving around 5, running home to eat a quick turkey sandwich or veggie burger, and then heading to my knitting group for the night. I didn’t get home til well after 7 and man, was I cranky. I briefly considered eating peanut butter out of the jar with a soup spoon (hey, it’s got protein). There was some glimmer of common sense and sanity left in my now-fried brain so I decided to fix myself something relatively quick but satisfying and healthy. I made what I like to call “Creamy Veggie Penne.” Before I give you the recipe, I just want to note a few things. I cannot abide going to the grocery store 27 times a week to buy fresh vegetables. Even though I love them I am a single gal cooking for one and most of the stuff in my crisper goes bad before I can finish it. Cooking in huge batches on the weekend doesn’t appeal to me, not only because I’m a relatively improvisational cook, but because the idea of being forced to eat the same thing or variations on the same thing for a whole week drives me directly to one of the numerous pizzerias in the area (I live in Jersey, that’s basically all we have here). Long story long, I stock up on frozen veggies. I love the steamer bags to pieces (sugar snap peas are my current jam) but I also keep a lot of frozen spinach and pepper strips in the freezer. 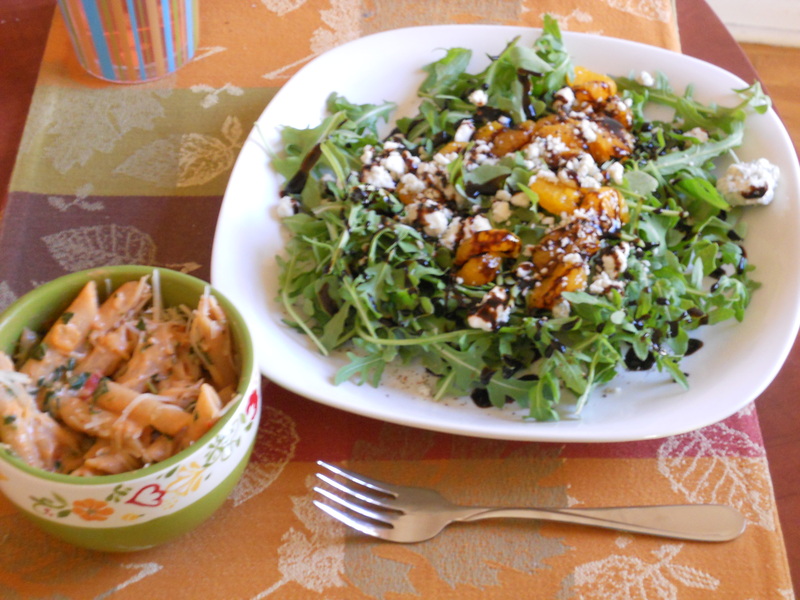 Also, you’ll note that my salad is on the dinner plate and my pasta is in a tiny prep bowl. I learned a long time ago that putting a reasonable and moderate serving of pasta on a full dinner plate will make me eat too much or just cry so I eat off of salad plates or from small bowls frequently. One last thing – I don’t use salt when I cook and I LOVE garlic and red pepper flakes so adjust to your heart’s delight depending on your feelings about these things. Cook whole wheat pasta according to package directions. While it is cooking, spray the bottom of a saucepan with Pam and put on medium heat. Once pan is hot, add minced garlic and cook until golden. Add pasta sauce and neufchatel cheese, stirring until cheese is melted and is blended with sauce. Add spinach, peppers and spices to taste. Simmer until your pasta is done. Drain pasta and return to pot. Pour sauce over pasta and stir. Put half the pasta in your bowl and save the other half in fridge or freezer. Toss all ingredients and put on a plate – done! Some things you could substitute in this salad that would be equally delicious are: goat cheese, shaved Parmesan, blood oranges, mango, raspberries, or strawberries. If you can dream it you can eat it! For us Weight Watchers folks this dinner comes in at about 11 points – 8 if you skip the cheese. I like to round it out with a Skinny Cow Dulce de Leche ice cream for 4 points cause that’s how I roll.